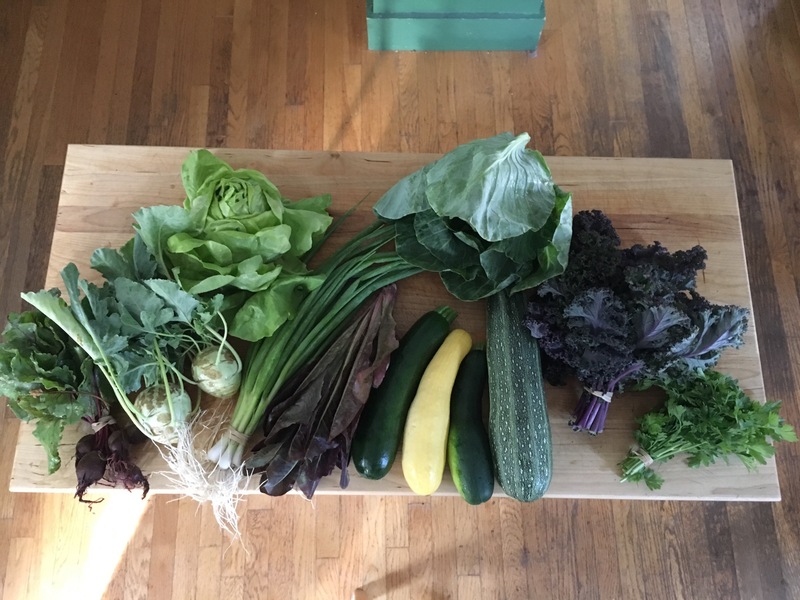 This is our bi-weekly farm share from Long Life Farm, an organic CSA in Hopkinton MA. This what we got and how I stored them. I don’t always have time to wash and store them the day I get them, but it usually works out fine to do it the next day since everything is so fresh. At the bottom, I have recipe suggestions. I wait to go to the grocery store after we get the farm share, so I can plan meals to use everything up promptly. Kohlrabi bulbs, beets, zucchini and summer squash are very tasty when sliced and cooked on the grill in a metal vegetable basket so they don’t fall through the grate. I usually serve them with grilled chicken or sausage, also with small potatoes roasted in the grill. Zucchini and squash cook quickly, maybe 3 minutes per side on the grill. Kohlrabi bulbs & beets take longer, maybe 6 minutes per side. Small potatoes more like 7-8 minutes per side. I’m not a fan of cole slaw, which is what many people do to use up their cabbage. The only cabbage recipe I really like is baked stuffed cabbage with tomato sauce. I start by steaming the whole head of cabbage for about 30 minutes. Then I fill each leaf with about 1 Tbsp of my favorite raw meatball recipe (sun-dried tomato chicken meatballs) and roll the leaves around the meat into balls. I put the stuffed leaves in a lasagna pan and cover with tomato sauce and a little parmesan cheese. I cover the dish with foil and bake at 400F for 30 minutes until meat is thoroughly cooked. Someday I might try to make sauerkraut, which I like, but have never attempted to make at home. We tend to get a lot of scallions (green onions), more than I can use up before the next farm share is ready. You can substitute them in most recipes that call for onions, so I avoid buying onions at the supermarket in the summer. They are good in stir-fry. You can use up both parsley and scallions in a cous-cous tabouli salad. If you have too many scallions and parsley, you can freeze them to use later in turkey stock at Thanksgiving. You can also dry them by slow cooking in the oven, then could be used as lightweight spices to take on a backpacking camping trip. For any variety of kale, I enjoy this Lemon-Parmesan kale salad recipe. Kale is tough, so the key is to let the dressing soak in for 5 minutes or more before serving and that softens up the kale. Bitter greens, such as kohlrabi, beet, radish or turnip, are kind of an acquired taste. But if you cook them in bacon grease with a little garlic slowly for a long time they do soften up. Then you can sprinkle with lemon juice and serve as a side or maybe over rice. They cook down to a very small amount, so I tend to also serve a second vegetable that people are more likely to enjoy anyway. The lettuce I have no problem using up. I tend to have a salad for lunch every day with grilled chicken. If I have a lot of romaine lettuce, I might make a caesar salad for a dinner one night too. This entry was posted in CSA Farm Share and tagged beets, bitter greens, cabbage, kale, kohlrabi, lettuce, parsley, scallions, summer squash, zucchini on July 8, 2016 by amywebdesign. 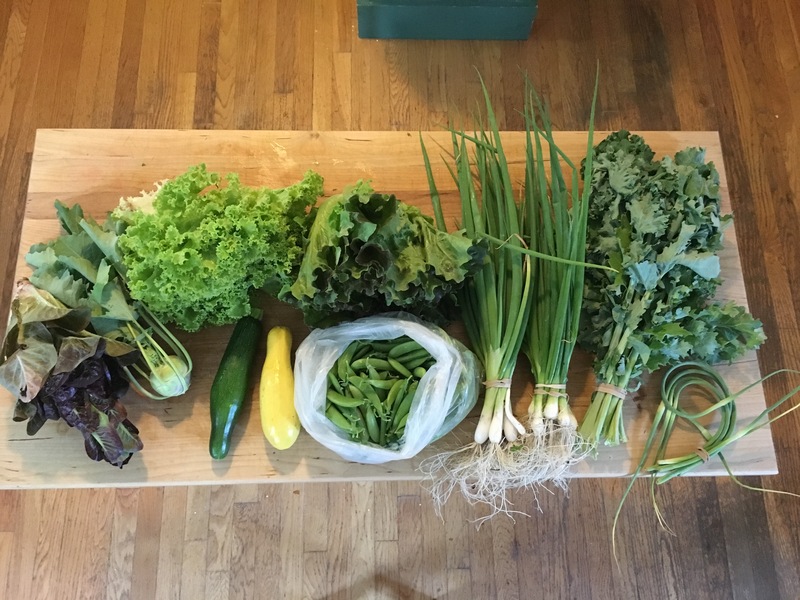 This entry was posted in CSA Farm Share and tagged garlic scapes, kale, kohlrabi, lettuce, scallions, snap peas, summer squash, zucchini on June 24, 2016 by amywebdesign.